Looking for a new place to list your blog for product review opportunities? Check out BlogDash. Ok so we all have those pins on Pinterest of our dream kitchen we would love to have someday or that amazing craft that you would like to do but never will actually take the time and sit down and do it. Honestly, I have a lot of pins like that myself. They are so neat but unrealistic for me. Sometimes I sit down and look through Pinterest for a dinner idea but get overwhelmed with all of the delicious looking dishes and end up too hungry to take time to actually fix one of those recipes. So, with that being said, how can you actually accomplish something you pin? 1) Be realistic. Yes, it is nice to dream of that jacuzzi in your bathroom but why not do something simple and affordable to make it look elegant instead? I have seen several tutorials on adding trim around a mirror or great organizational tips to make a plain bathroom look fabulous. 2) Set aside time. If you have time to browse Pinterest and keep pinning and repinning things that you like, how about setting some of that time aside to actually DO one of those things you pinned? Stop browsing and just pick one of those delicious dishes you have already pinned, then, set aside 30-45 minutes to cook it! What are some other ways you suggest to help other pinners actually accomplish something from Pinterest? 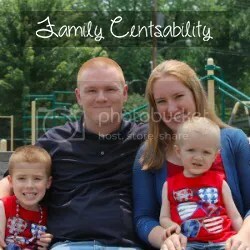 Remember to follow Family Centsability on Pinterest!